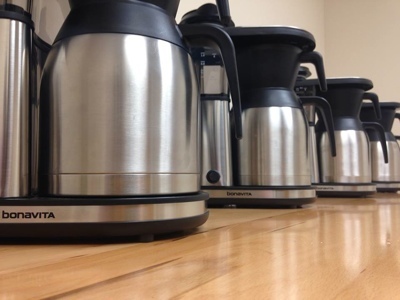 When brewing a coffee for evaluation, we have chosen to use the BonaVita BV1900TS home brewer. It is certified by the SCAA to meet and maintain the brewing standards of time, temperature, and uniformity- getting the same results brew after brew. This brewer also comes in at a reasonable price point and has is backed up by great customer service from BonaVita. In our brew evaluations we use a standard ratio of 55 grams of coffee, ground to a medium/fine grind, to 1 liter of water. When a coffee sample is darker in roast, we use a standard ratio of 45 grams of coffee to 1 liter of water. Darkly roasted coffee tends to be more water soluble, often leading to a heavier brew. This necessitates a different ratio of coffee to water in the end. We use a tool called a refractometer to measure our brews at random to ensure they are reaching consistent results (a content of dissolved coffee between 1.2 – 1.4% in the brew). generally considered pleasant to the majority of people. 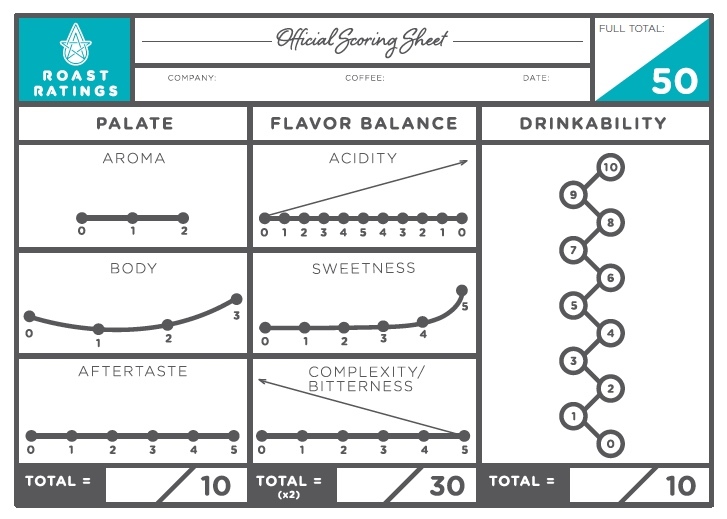 The most heavily weighted scores are Acidity, Sweetness, and Bitterness, which equate to the coffee’s overall balance of flavor. This is the primary indicator of a desirable coffee. Additionally we account for other factors that relate to how you experience your coffee such as Aroma, Body, and Aftertaste, as well as what we call “Drinkability”. The evaluation is worth up to 50 points (doubled to add up to 100) and is used to determine the Star Rating. We created this evaluation system with a perfect score as a possibility, though it is a rare occurrence. At Roast Ratings the Star Rating is our main focus in grouping coffees of quality. If you want to dig deeper into our results, separate scores can be found in the detailed review, as well as the score out of 100 for your reference. At first glance the score items listed in this section have very little to do with the flavor of the coffee. 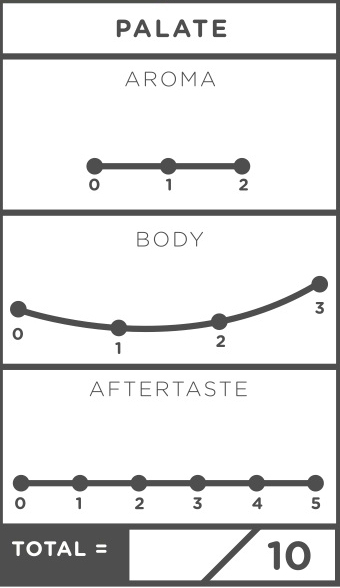 But aroma, body and aftertaste are important key points in your drinking experience. Aroma is your very first impression of the coffee. Long before you drink it you start by smelling it, anticipating the experience. While body has nothing to do with flavor, it’s the textural backbone that carries the flavor. And aftertaste is the last impression of a coffee- a contributing echo of your experience. Much like it sounds, aroma has to do with the smell of coffee. In our brew evaluation aroma is the first item scored before tasting begins. Dynamic and inviting coffees will receive a higher score. A score of zero can be either from off putting odors or a complete lack of aroma altogether. The body of a beverage is all about texture. Is it heavy or light? Dense or thin? Juicy or flat? Is it smooth or rough as it goes across the palate? The primary focus of this score item is to determine how pleasant the body, texture, and weight are as an experience. Most people think about how a coffee tastes as they are drinking it, but what happens after you swallow? Do the flavors keep unfolding in a long pleasant way? Do they stay on the tongue with unpleasant bitterness? Or does the coffee just fall off quickly, forgettably fading away? In coffee it’s often the last impressions, rather than the first, that stays with you. 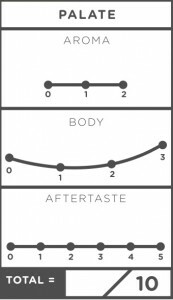 If palate scoring includes the opening and closing acts of a coffee’s show, flavor balance would be the headliner. Broken into 3 separate categories adding up to 60% of the final scoring, this section is where most of our analysis takes place. Not referring to the actual acid content of coffee, acidity is about the lively and bright flavors present in the cup. Citrus or stone fruits (apricot/peach) are sometimes descriptors for this quality of flavor. 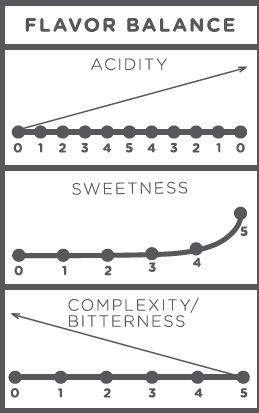 When evaluating acidity we assess the intensity, quality and balance of them. When a coffee’s acidity is very intense it can sometimes overwhelm the other flavor qualities. For this reason our scoring scale goes up to 5, which we consider the point where the intensity is just right. However, this particular score will go back down in value if the intensity is too high. As a raw agricultural product coffee has materials that get caramelized during the roasting process, creating varying levels of sweetness in the final cup. Descriptors for sweetness in coffee can include brown sugar, caramel & malt among many others. Sweetness scores go up based on intensity and presence in the cup. It is our belief that a coffee can not be too sweet, though without the appropriate acidity or bitterness it can still be out of balance. When it comes to coffee, the term “bitter” is a common descriptor. Much of what we think of as bitterness in coffee is the result of darker roast profiles, hearkening to the taste of a burnt cookie. But not all bitterness tastes like “burning”. When in balance the bitterness doesn’t dominate, and can often anchor brighter flavors with tones of dark chocolate, spices, or tannins. This score starts at 5, indicating little to no bitterness (or pleasant aspects), and it goes down in value the more intense or unpleasant the bitterness becomes. Professional or not, it is easily said that drinking coffee is a rather subjective experience. Everyone has their preferences. The final category only includes one criteria of “Drinkability”. This is where we give a measure to our overall experience, keeping in mind how universally desirable the flavor is. Pretty straightforward in its interpretation, Drinkability is about evaluating the overall impression of the coffee, asking ourselves questions like- Did I enjoy this coffee? How likely would I be to seek out this coffee again? Do I want another cup? In their unaltered forms, sweeter, more balanced, lower acid/bitter coffees tend to be more drinkable.